Metal Products Engineering works closely with inventors, artists, start-ups and small manufacturing businesses. We understand the unique needs of entrepreneurs who often do not have R&D or engineering departments to "work out the kinks" in a new product design. We provide engineering and prototyping support to help you bring your ideas to market. Whenever possible, our engineers will suggest design improvements to reduce costs and increase performance. Metal Products Engineering offers a full range of cost effective services that can assist you in every phase of your project from design to delivery. Our team of experienced engineers can help you realize your ideas. We have produced successful products starting from only a sketch on a napkin or a description. We don't have to add additional costs and time for outside tooling to a project. We do it all in-house - faster, cheaper - you reap the benefits. This is where the rubber really meets the road. Our ability to create in-house tooling, coupled with quick in-house prototyping, means lower cost and faster time to market. Ideal for low cost, low volume manufacturing and machining where you want high precision and finish without secondary operations. Great for any material, including metals, wood, plastic, rubber, stone, glass and more. We have the capacity to cut, stamp and form virtually any shape from extremely thin metal foils to 3/8" thick steel. 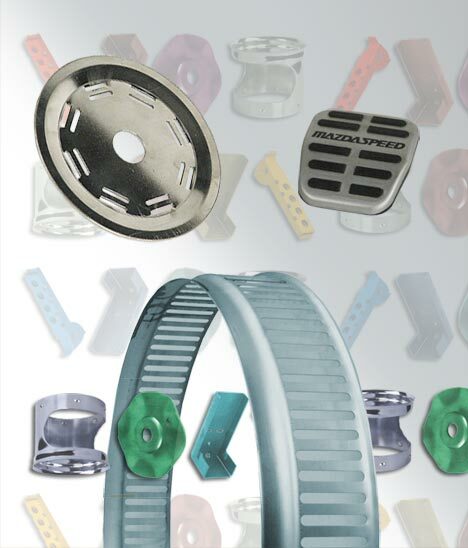 This is an extremely efficient manufacturing method whereby complex parts can be manufactured in a single pass. Many products or parts require secondary finishing operations including assembly. Metal Products Engineering provides full finishing, assembly and packaging services. Your products can ship direct to store shelf or end customer from our manufacturing line.